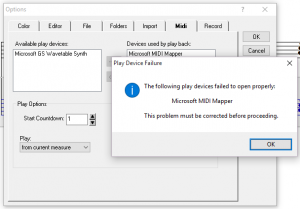 After upgrading to Windows 10, you might encounter the following error when using NoteWorthy Composer Version 2.51a or earlier: This error is caused by a Windows 10 change to the MIDI device subsystem. In Windows 10, it is not possible for NWC to release the default MIDI device, and then reattach to it. This process fails, causing the problem shown. This will reduce the number of times that the program releases and then reclaims the MIDI play device. This will make it possible for you to navigate out of the Midi options tab. The default MIDI device will still get used automatically when you start play back. 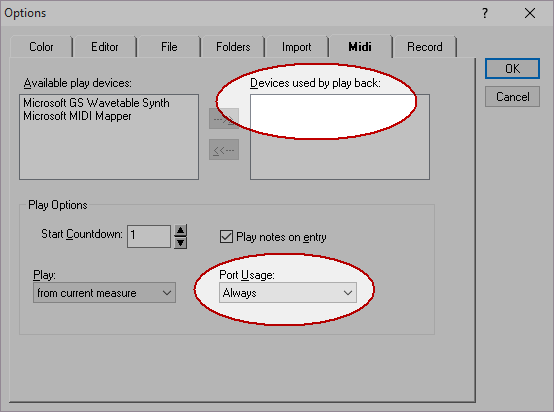 Since the program cannot successfully release/claim the MIDI port on Windows 10, you will have to repeat steps 2 and 3 each time you visit Tools, Options, Midi. Update: It appears as though Microsoft finally got around to fixing the Windows 10 GS Wavetable Synth problems in build 10586.